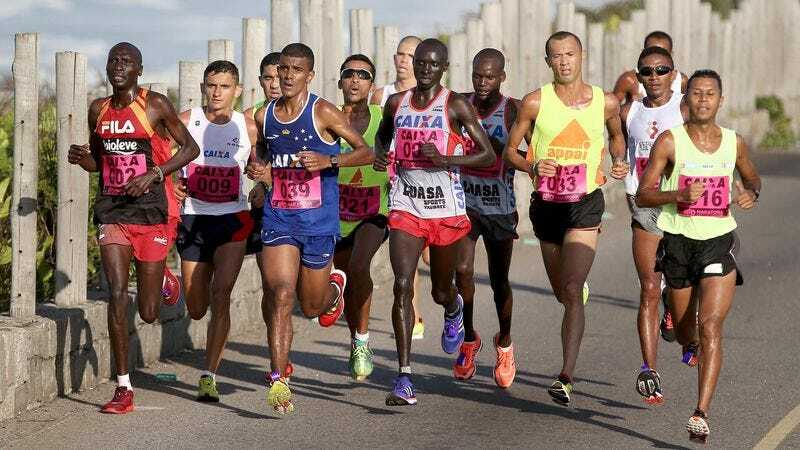 RIO DE JANEIRO—Recommending considerable precautions during the event, police in Rio de Janeiro issued a warning Friday advising all runners to avoid miles 4 through 23 of the Olympic marathon course. “For their own personal safety, all marathoners are strongly urged to steer clear of these particularly dangerous sections of the running route,” said police chief Fernando Veloso, adding that even when in areas of the course designated as safe, runners should stick to well-lit parts of the road and always run in groups with at least three or four other competitors. “If you absolutely must pass through any areas of the marathon course between miles 4 and 23, we ask that you make sure to let a family member know so they can alert the authorities if you don’t arrive at mile 24 within a reasonable mile time. However, we strongly recommend that runners make alternate arrangements for getting from the start to the finish line.” Veloso added that runners should not wear flashy, expensive running shoes in order to avoid unwanted attention, and are also advised to carry a fake wallet in their shorts in case they are confronted by a mugger.